The most powerful machines for translation and language learning providing speech-to-speech and full text translations. Also good for travellers. Light versions -> light price! The most reasonably priced talking electronic dictionaries! The first-ever Free Speech Electronic Translator - speak whatever you want, and be understood. With the C-Pen you can scan and load printed text to your computer with no strings attached. Welcome to ECTACO Online Dictionaries! In the world of today, you have to make every minute count. In the world of today, you have to conserve space and make room for the things that matter most. ECTACO takes you on a journey to the world of words and language, now in cyberspace. Do both - save space and time by accessing the information you need in virtually no time! ECTACO Online Dictionaries incorporate some of the best ECTACO word databases and they are here to introduce you to the advantages of using electronic translation tools. 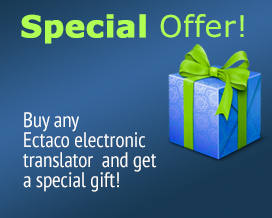 ECTACO Online Dictionaries give you special editions of our superior translation engines and let you get a feel for the quality of ECTACO translation technology. No more turning book pages and searching for words endlessly; save your time - the words you are looking for are at your fingertips, just one click away!